I’m starting to look into developing a version of TRS-Box for the TRS-80 Model II TRSDOS 2.0 operating system. I already have working versions of TRS-Box for Model II LS-DOS 6 and Model 16 XENIX, but given that TRSDOS 2.0 was the standard Model II operating system, I thought it was important for it to have a working version of TRS-Box. be slow and tiresome today. So, I need a way of copying the finished program executable to the Model II for testing. The built in serial file transfer utilities of TRSDOS 2.0 are not great, especially for trying to communicate with a modern system. 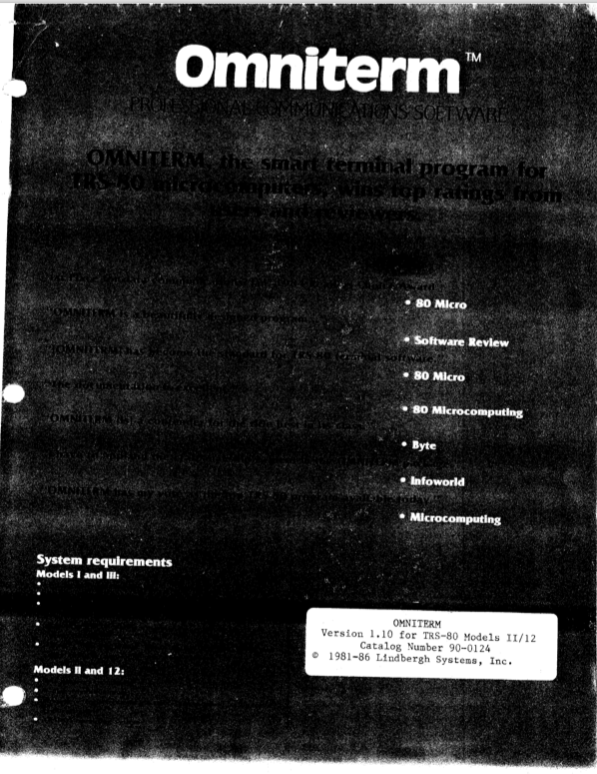 Luckily, we have a copy of the excellent OmniTerm for Model II software in the model2archive. For the MacBook side, I use the very capable Serial program for all my serial port communication needs. It works well with all of my TRS-80s and operating systems. Also required are a couple of special serial cables. I’ve detailed the steps I followed if you would also like to copy files to your Model II running TRSDOS 2.0. There are many other ways to achieve this goal, but I found this configuration to work well. The steps should be similar if you are using Linux or Windows with a capable serial communication program. It is expected that you are familiar with how to use IMD disk images with your Model II. Set up the physical serial link between the MacBook and the Model II. You will need a 25 pin RS-232 Null Modem cable on the Model II side. 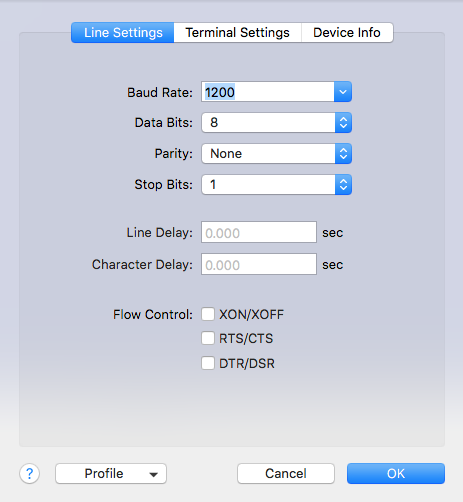 For the MacBook, use an FT232R compliant USB-Serial adapter. On the Model II, you need to make sure you use serial port A. It is recommended that you have another serial device or a serial terminator on port B. The Model II Owner’s Manual shows how to create a serial terminator. Get the Serial program for the MacBook. Get OminTerm running on the Model II. The OminTerm disk is not a bootable disk. Follow the instructions in the OmniTerm manual to set it up for single disk bootable operation if you only have a single disk drive. I have multiple disk drives so I use a TRSDOS 2.0 system disk in drive 0 and the OmniTerm disk in drive 1.
higher baud rates should work as well. The Model II has a maximum baud rate of 9600. Set up the serial port in TRSDOS on the Model II. Before you start transferring files, you will want to verify that you have the serial connection properly configured. You can do this by running the OMNITERM program on the Model II. Once it comes up, anything you type on the Model II should show up in Serial on the MacBook and anything you type in Serial should show up in OmniTerm. If you have this working, then you are good to start transferring files. If not, then you need to go back and check your setup. Now you are ready to start transferring files. On the Model II we will not be using the OMNITERM program since that is a general purpose terminal program. It does have ASCII based file transfer support, but we want to use something more reliable than traditional serial ASCII transfer. On the OminTerm disk there is a program called OMNIXFER. This is an XMODEM supporting file transfer program. XMODEM is a reliable serial file transfer protocol developed by Ward Christensen in 1977. Once you run OMINXFER, it will ask you if you want to send or receive a file. Start with sending a file to the Model II so choose R. Then it will ask for a filename of the file you want to create in which to place the received file contents. The program will then wait for a file to arrive in XMODEM format on serial port A. In Serial, got to File->Send File. 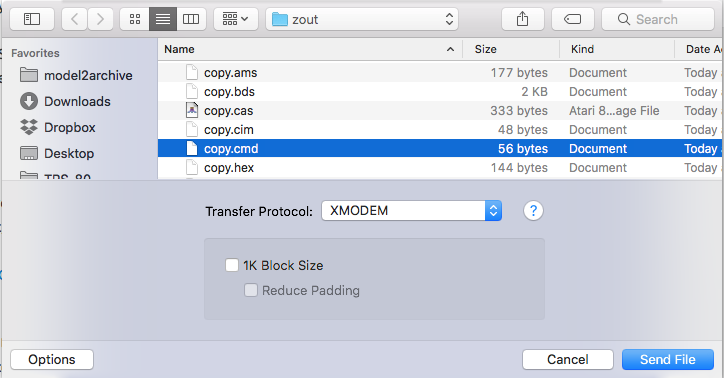 Choose XMODEM as the Transfer Protocol. Leave the 1K block size unchecked. Choose the file to send and click Send File. You should see the file transfer begin between the two machines. The process is reversed for getting files from the Model II to the MacBook. In Serial, go to File->Recieve File. Select XMODEM and Checksum error checking. Click on Receive. Then, on the Model II, run OMNIXFER. Select S to send a file. Provide the TRS-80 file spec of the file you want to send and the file transfer will start. One special consideration needs to be taken when working with TRSDOS 2.0. Model II TRSDOS treats data files and program files differently. When you receive a file on the Model II, you will need to run the OMNICONV program on the OmniTerm disk to convert the file to the proper type. For program files, choose Fixed Length and Program type. For data files, choose Variable or Fixed, depending on which type of data file you are transferring. Hopefully you can now transfer files back and forth with Model II TRSDOS. Leave a comment to let me know how it works out for you. I used a Tandy trs 80 model and used to set up stations in the Sheriff’s office and connected 10 users that ran seizures and sales, lisence sales and reporting to state ran a balance report that balanced license sold against monies collected for the month. I ran payroll. I then set up a T1 line from courthouse to parish jail and conducted programs for food inventory, equipment inventories, etc. I also ran a separate program for the court to hold arraignments to allow judge to hold the arraignment from the computer room at the courthouse 10 miles from jail. This was done in 1984.